On Sunday morning (May 22) at 7 a.m. EDT, Mars reaches opposition with the sun. This Sunday morning (May 22), Mars reaches opposition with the sun. This means that the Red Planet will be exactly opposite the sun in Earth's sky, making this weekend a great time to see it for yourself. In fact, Mars will soon be at its closest point to Earth in over a decade. Because Mars is directly opposite the sun (in relation to Earth) during opposition, Mars rises as the sun sets, and sets as the sun rises. This also means that Mars is visible all night long this weekend. To mark the occasion, NASA scientists used the Hubble Space Telescope to capture an absolutely stunning view of Mars as it nears opposition. The easiest way to spot Mars this weekend is to go out when the Red Planet is highest in the sky, close to midnight local time. Remember that if you live in a part of the world that is on daylight saving time, that "sweet spot" of viewing times will be close to 1 a.m. your local time. If you live anywhere north of the equator, Mars will be due south at midnight local time. If you live south of the equator, Mars will be high overhead. On opposition night, Mars will be close to the nearly full moon, and will be the brightest object in the sky, except for the moon and Jupiter, over near the western horizon. 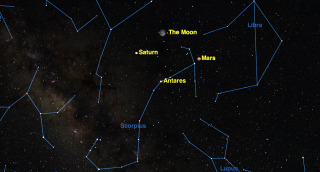 Look for Saturn and the bright-red star Antares nearby. This sky chart from Sky & Telescope magazine shows the location of Mars on May 20, 21 and 22 in 2016 as the Red Planet reaches opposition in the night sky. The most striking thing about Mars' appearance to the naked eye is its red color. This will be particularly clear if you compare it with Jupiter over in the west. They are almost equal in brightness, but Jupiter is a pale cream color, whereas Mars is noticeably red. If you view Mars through a telescope, you are likely to be disappointed. All of the planets are much smaller than people expect, and this is particularly so with Mars, because it is one of the smallest planets in the solar system; only Mercury is smaller. You may have heard an internet rumor that, on a particular date, Mars will appear as large as the moon. This is physically impossible, because Mars is always much farther away than the moon, and never appears larger than 1/70 of the diameter of the moon. On opposition night, Mars will be only 1/100 of the diameter of the moon. In other words, it will take a telescope magnifying 100 times to make Mars look as big as the moon as seen with the naked eye. It takes a trained eye to see detail on a disk that small. Experienced planetary observers spend years sketching Mars at every opportunity, trying to catch the rare instants when Earth's atmosphere steadies enough to reveal Mars' secretive details. It takes patience and an optically excellent telescope. Usually, Mars observers first look for the planet's polar ice caps. However, this year, Mars is close to its equinox, so both polar caps are at their smallest, and thus hard to see. What may be visible is the pale haze that forms over the polar regions. It is usually possible to see so-called albedo markings, variations of dark and light caused by the alternation of bedrock and desert sands. The darker areas appear grey-green, while the lighter areas are a pale peach color. The contrast between light and dark is very low but may be enhanced by using a red or orange filter. Oddly enough, although Mars is directly opposite Earth on Sunday morning, it is not at its closest. Because of Mars' eccentric orbit, it will still be getting closer to Earth on opposition night, and won't reach its minimum distance (and largest size) until almost a week later, on May 30 at 6 p.m. EDT (2200 GMT). The difference is only 5 percent, which is too little to make much difference. On May 30, Mars will be the closest it has been to Earth since November 2005, giving us the best view we have had in over a decade. Don't miss it. This article was provided by Simulation Curriculum, the leader in space science curriculum solutions and the makers of Starry Night and SkySafari. Follow Starry Night on Twitter @StarryNightEdu. Follow us @Spacedotcom, Facebook and Google+. Original article on Space.com.